At the gym that morning, a 40 pound barbell fell off the bench on to my foot. This picture is what it looked like within a couple of minutes. I didn't cry, though I'm not sure how. 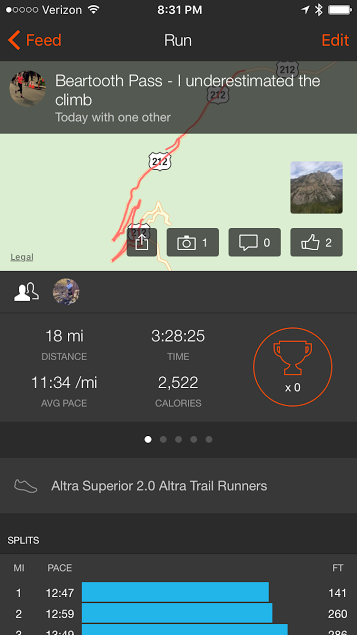 I'm pretty sure my runner's denial kicked in immediately: "That didn't happen! I have a long run tomorrow. Rub some dirt in it and walk it off!" Ha! I did rack my own weights and hobbled to the front desk for a bag of ice. By the time I got to work, the bruise had disappeared but I knew it would be back. It was pretty ugly by Sunday. I didn't go for my long run the next day, but I went with Mitch on his. We ran 8 miles that Saturday. I'm so proud of him for putting in the training for our Yellowstone Half Marathon. Three weeks away now! BTW... look at the calves on that guy! Dang! My own long run was supposed to be 18 miles. 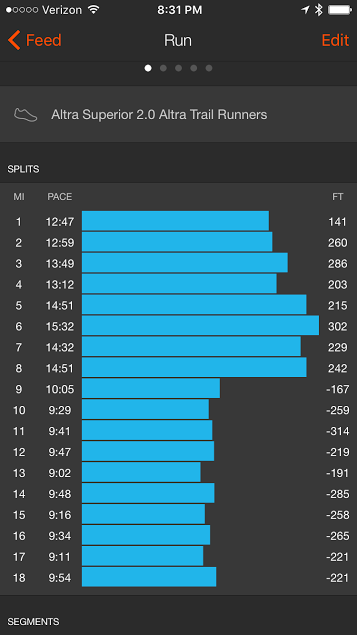 Since we had afternoon plans on Sunday, I didn't have time to put in that many miles so I went for a half marathon. In spite of my accident, I still managed a total of 21 miles that weekend. I admit... I thought I was pretty tough stuff, but really I think I just got lucky. I will never set my weights on the bench again. Bad idea. This week I had to put in the 18 miles. Mitch's plan was to ride up the Beartooth Pass since it will open to traffic next week and I figured on a mix of road and trails but didn't have route in mind. The truth is, I'm a little chicken about running mountain trails all by myself so instead I came up with another brilliant plan ~ why not take advantage of the closed road and run up the Beartooth Pass?? To the look out point, it is a nine mile climb from the campgrounds outside of Red Lodge. I often start my long runs from this place but run down in to town for 12 miles. It's pretty much my favorite. I was all by myself. Mitch was already headed up the mountain on his ride. I had my music on without headphones, the logic being that it would be my anti-bear noise. Just as I got out of the campgrounds and heading up I could hear cracking in the woods next to me. I turned the music off and decided that I would rather hear if something were coming. I had packed the bear spray in the front pouch of my vest, by the way. There is some construction on the pass as crews work to secure the landslide/rock fall areas before opening weekend. At about 3/4 mile up, a big truck pulled up next to me and warned me that a bear had just crossed the road behind me (guess what that cracking noise in the forest was). For the rest of the way up, that bear spray was in my hand with the safety off. The first miles were scary. My senses were on hyper drive and I was paranoid. Eventually, I started running by the work crews here and there and that helped me feel better. The pass climbs with switchbacks. A couple of times I could see Mitch above me and we played waving games. I walked a LOT. 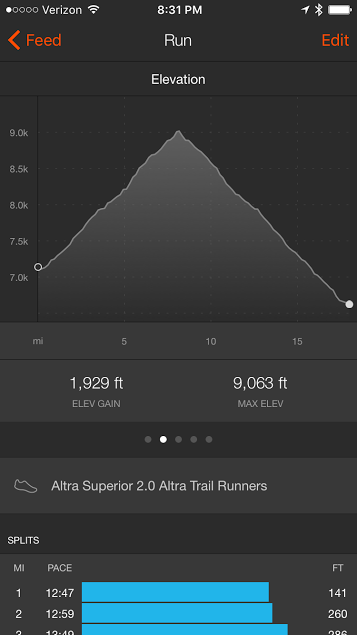 I had definitely underestimated the difficulty of the elevation gain. But the view was pretty spectacular (I wish I had taken more photos). At about eight miles up there was a crazy loud boom. I could even feel it in the ground beneath my feet. I wheeled around looking for the thunder clouds, fearing what a dreadful descent I would have if a storm barreled down on me. At that perfect moment, Mitch came riding back down. I was still about a mile from the lookout but neither of us knew what had made the sound. I decided it was best to head back. Mitch later asked a construction guy about the boom. Turns out they were doing controlled avalanches on the mountain above us. This was just before I turned back. I had trekked 2,000 feet up in 8 miles (yep, that's bear spray in my hand... and thankfully Mitch put it in his pocket after this. I hate carrying things in my hands while I'm running). My legs were so tired after the ascent that even when I headed down it was hard. But I do love a good down hill run! We passed some workers on the way down and a lady (who was basically hanging from the rocks off the side of the road) made a comment that she couldn't believe I'd run all the way up there. So, yeah. That made my day. The weather was fantastic with exception of a couple of places the wind picked up and sand blasted us on the way down. BTW, did I mention that Mitch stayed with me the whole way down? After working his way up that pass, the best part is getting to ride fast coming down. He gave that up to keep me company. I felt safer and I appreciated it. At the bottom, where the gate is closed across the highway there is this gorgeous view. It's still about 3/4 mile from the campground. I love this place. It was a crazy plan to run up the highway by myself during spring in bear country. I had just as much chance of running in to wildlife there as I would have had on the trails below. Even though some of it was scary, I'm glad I did it. Later when the road closes, I hope to get back up there and make it to the look out point. I love Strava. It's fun to look at my stats when I'm done. It's like my run is immortalized in cyberspace. After a hard day's work: scotch ale for the win! The brisket sandwich was pretty good too. As we enjoyed our lunch at Foster & Logan's, a storm rolled in bringing wind, rain and hail. Boy did we get down off that mountain just in the nick of time! Have you ever encountered a wild animal on your run?